From “Speloncae” to “La perla del Tirreno”, it has been nominated for its peculiarities. Sperlonga, a small village of just under 4000 souls (number which doubles or more during the summer months), stands out with its whiteness extending into the sea exactly halfway between the Gulf of Circeo and Gaeta, still halfway between Rome and Naples. “Bandiera Blu<” certified for 20 years in a row, it’s clear waters are home to a unique variety of fish and marine landscapes appreciated by artists over thousands of years. Just to mention that in these places were built many Roman patricians “villa”’s, the most important among them the Emperor Tiberius’s one, who arranged and edited one of the largest and most beautiful caves into the home with “comodities” such as banquet rooms and fish farms, probably moray eels well known for their delicious and tender meat. IN THE MIDDLE AGE A SMALL FISHING VILLAGE. 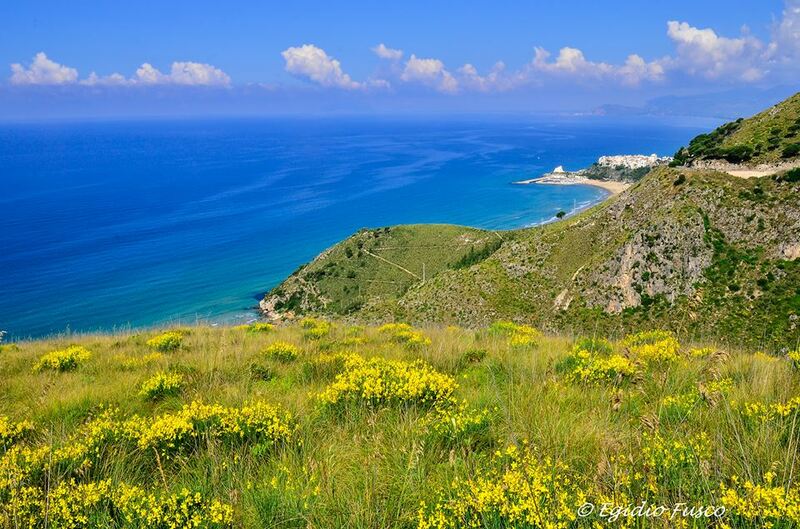 SPERLONGA AND THE MYTHICAL CITY OF AMYCLAE. The area of Sperlonga, along with the whole Piana di Fondi, as evidenced by numerous finds, has been populated since the time of the Upper Paleolithic. 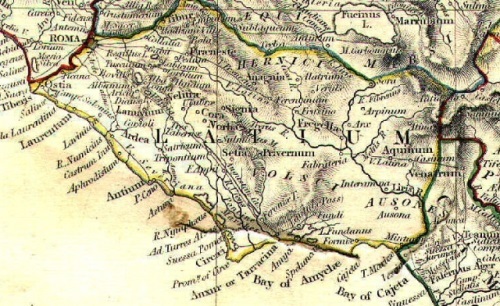 The area is inducted into mythology that takes the existence of the city of Amyclae, founded by Lacooni, in the immediate vicinity of the Cape. As mentioned above though, it was the Romans who settle here first with luxurious residences to enjoy the mild climate and breathtaking scenery. The villa of the Roman Emperor Tiberius embraced a large cave, where were placed fine works that celebrated the deeds of Odysseus. Towards the 6th century the ruins of Roman villas served as shelter for the community and the local population that gave rise to the first households of Sperlonga. A population which slowly started to take cover on the Hill of San Magno, necessity given by greater protection against pirate attacks. For this some watchtowers were built and that were constantly destroyed and rebuilt after numerous lethal landings of the legions under the command of Kaireddin Barbarossa. Signs of history which can still be found today in the alleys of the village, in painted murals along the white walls of the historic centre. The current “tortoise” form of the ancient village is due to the ‘ 700 and ‘ 800. Sperlonga lingered for years, a small seaside village that lived by fishing and agriculture, with a very high poverty rate. The breakthrough came only in the late 50 ‘s of the last century, when the current via Flacca, was completed , artery that connected easily the towns of Terracina and Gaeta, toward a vanishing point to Formia with the ancient Appian way. Sperlonga, which is literally surrounded by the Flacca became easily accessible from North and South. In the meantime important archaeological excavations unearthed the beautiful and priceless artifacts from the villa of Tiberius and the homonymous cave. Only a click of pride of a whole town, which implemented a land and sea blockade ever before seen, managed to avoid that the finds were transferred to Rome, setting the stage for the current Museum of archaeology and conservation area, real culture and history attraction around the shoreline. In the white and sunny hot stone alleys and, in the fields, on fishing boats worn and lived for generations, was born “Neorealism” that, with images of film director Giuseppe De Santis showed these places all over the world. Sperlonga with its beaches and ridges of rock overlooking the sea will be the scene for other productions over the years, including “at 30 million km from Earth” (1957 Austrian film directed by Nathan Juran) and some music videos, including Jermaine Jackson (one of Michael Jackson’s brothers) and Pia Zadora (“When the rain begins to fall”). Many commercials were filmed too in the squares of the old town, but especially along the scenic route which connects the inner town of Sperlonga to Itri. Street among other things where it is organized for more than 10 years the prestigious trophy “Rally of Sperlonga. But the attendance of actors and celebrities of the film and entertainment world is mainly due to the vitality of the actor Raf Vallone that, while filming “ Non c’è pace tra gli ulivi”by De Santis the actor fell in love with the village and built his summer residence there. “For over 30 years,” said a few years before missing, in 2002, “I invited to Sperlonga many celebrity friends. Albert Camus, who had African origins, he was dazzled by the small white village. My host was also Arthur Miller, Marlene Dietrich that captivated everyone with his elegance. Even Brigitte Bardot was my guest in the’ 60’s “. Among the other celebrities who have been in Sperlonga, the Director Luchino Visconti, the American artist Andy Warhol, the Greek actress Irene Papas, Ornella Muti and writer Natalie Ginzburg, today prominent figures of culture and entertainment continue to visit Sperlonga not only for vacation, but also for cultural and entertainment events that animate the village, especially in summer, first among all the prestigious “Premio Grotta di Tiberio”. Sperlonga, which is part of the circuit of the “most beautiful villages in Italy” today hosts many tourists from all over the world, and not only in summer. “Bandiera Blu” certified for over 20 years, award-winning by Legambiente for the clean city and its bathing waters, mild climate indeed often attracts visitors from Northern Europe and the former Soviet republics, eager to enjoy temperatures definitely warmer than to their countries in the months from March to June. Particularly appreciated by these visitors the food and wine clubs, become in some cases real excellence required and known outside the Italian peninsula. 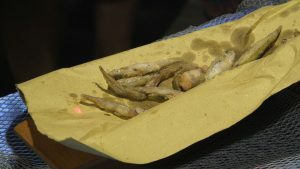 Among the latter, products such as tomatoes and local vegetables, not least the Celery of Sperlonga. Not to mention of course fish products. A good portion of the industry have come together under a single body, the Consorzio Sperlonga Turismo, led by Leone La Rocca, founder and Coordinator, inter alia, to events such as “Sapori di Mare” and “Ronde Rally Sperlonga, “appointments that have both more than 10 years. Very popular and also expected the demonstrations revolving arou nd the festivities of the patron saints of cities, St. Rocco and St. Leone. Events that, with processions of faithful Saints accompanying local effigy for narrow alleys of the white village, still attract tourists from everywhere. Very visited not just the parish of s. Maria Assunta in Cielo (in Europe square, right next to the Town Hall), but also the former Church of St. Mariae De Spelonche. used and transformed now into a Multimedia Center for cultural activities and conferences, the building dates back to the 12th century and is mentioned in a document dated 1135 as an important place of worship. Recent renovations have brought to light not only the chapels dedicated to St. Leone and St. Domenico, but also some precious paintings dating back to the 12th century. Highly visited feature Torre Truglia, which is literally on the tip of the promontory of St. Magnus. Recently renovated, now offering spaces for cultural and artistic events and an organization that deals with local sea and coasts spread the culture in General. Many other towers were present along the coasts, especially towards the South, whose ruins are now almost invisible. The coast of the Tyrrhenian Sea is dotted with numerous towers built to spot and to defend against attacks by sea. The towers of Sperlonga dates back to 1500. The central tower, of which only part survives in the current via Gandhi, dominated the country and its profile is drawn in the current coat of arms of the municipality. 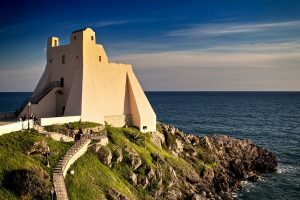 The Torre Truglia, stands on a rock of stone on the extreme point of the promontory of Sperlonga. Built in 1532 on the foundations of a pre-existing Roman tower of sighting, just two years after it was devastated by the hordes of Kaireddin Barbarossa. Rebuilt in 1611, when it housed a Sergeant and one soldier, as early as 1623 was again destroyed. Blossomed only in the next century, when constituted a safe lookout around the shoreline. From 1870 to 1969 was used by the Guardia di Finanza. Currently it’s open to the public during most of the day. Inside, an information Office managed and coordinated by the Consorsio Sperlonga Turismo. Coastal defence system was completed by the Torre del Nibbio and the Torre Capovento, which rises about 3 km south of the city. Built on a rocky spur overlooking the sea in 1532, after various events, it served from 1820 as a customs post. After the almost complete destruction, has only recently been rebuilt. The territory of Sperlonga is within the area managed by the natural park of Monti Aurunci, along with the protected areas of natural monument Villa of Tiberius and Costa Torre Capovento – Punta Cetarola. In such environments include the pines of Aleppo and the rare dwarf Palm, within the vast Mediterranean overlooking from the surrounding hills to the sea surges. Also many animals such as the hoopoe, Peregrine Falcon, kestrel and the herring seagull. For the last twenty years the town has changed considerably, with an unprecedented urban rationalization, restorations of ancient sites and a complete overhaul of the small Marina. In addition, the municipal administration, in agreement with the authorities and local actors, promotes a campaign on safety of bathers and tourists, with the mainstay of watch towers and assistants to bathers, and the obligation for the bathing establishments, to have specially trained staff and defibrillator for use in emergencies. In Italian, in English and Russian, we take you to discover the most evocative points of the historic center of Sperlonga! For any problems related to tourism, do not hesitate to contact us! If you need a taxi service to transfer to one of the airports (Rome or Naples), we can help you! We can help you find a hotel, restaurant or any other business by choosing them with you among our members! Keep in touch with us and stay up to date on all the activities and events that take place in Sperlonga during the year!